To speak of someone 'plumbing the depths' is often to be derogatory about their activities. 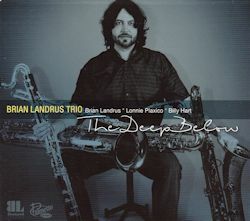 However, that phrase can be used in an affirmative way about this album from the Brian Landrus Trio. Landrus, you see, is a master of the so-called low wind instruments. On this recording he plays no less than four of these - baritone saxophone, bass clarinet, bass flute and bass saxophone. This is the sixth album to feature him as leader but is the first with as a trio. Lonnie Plaxico on bass, from his early days with Art Blakey's Jazz Messengers onwards, has a record of successful collaboration with numerous musicians on the jazz scene. Billy Hart, whom I had the pleasure of hearing live in April of this year, is a veteran and versatile drummer of distinction. Both shared in Landrus' 2011 quartet album, Traverse. Landrus himself has figured on several occasions in the DownBeat Critics Poll as a Rising Star, not to mention touring extensively with Esperanza Spalding's band, for instance. He has also composed or co-composed (with Plaxico) most of the music on this disc. There are several particularly strong tracks on this recording. Sophisticated Lady was, we are told, inspired by the Harry Carney version with the Duke Ellington Orchestra. What we have on the Ellington number is a delight, top-notch material treated with affection by Landrus on baritone, ably complemented by Plaxico's brief but probing bass solo. There is a lushness of tone from Landrus which is wholly admirable. I was taken, too, by the Landrus original Will She Ever Know, an outing for bass flute with totally sympathetic support from Plaxico and Hart. Or how about a poignant song associated with Frank Sinatra, I'm A Fool To Want You? It's one where Sinatra got part of the credit for the lyrics but actually it is the Billie Holiday version of this song which provides the inspiration on this occasion. Landrus does full justice to this lovely, heartbreaking ballad and Plaxico excels on bass alongside him. The Beginning has Landrus on bass saxophone, an instrument that the BBC christened 'The Lowest Of The Low' almost thirty years ago when they made a film about its place in jazz. On this track, Landrus investigates the lower registers, with a decidedly gritty timbre to his playing. There are a couple of bass clarinet tracks which are appealing, namely Just A Fading Melody and Orebro Treaty, the latter being a strong theme and an example of the trio at their best. The only drawback regarding the album is, perhaps, a certain sameness of mood and tempo, though The Age, a faster piece providing an opportunity to exercise the group's improvisational chops, is a welcome exception to that. I was also somewhat disappointed with Coltrane's Giant Steps, which to these, no doubt untutored, ears sounded like Landrus practising his scales. All very accomplished but... Yet these are minor reservations compared to the positive comments given above. Brian Landrus is clearly a very fine musician across a range of instruments and is a gifted composer. He is still in his thirties. There is obviously much more high quality music on its way in the coming years.